In honor of the cosplay season Pearson's Renaissance Shoppe has been expanding our cosplay costume inventory. We currently have several options for men, women, and children. What is cosplay you ask? If you don't already know of course. Cosplay is similar to LARP (Live Action Role Play) and SCA (Society for Creative Anachronism) in that it is a performance art where a specific character or idea is portrayed by a cosplayer who wears costumes and accessories. They sometimes attend Comic Conventions, or a Comic Con, which is an event where creators, experts, fans, and even guest stars amass to attend parties, panels, and join discussions that are all centered on many facets of comics. At several comic cons you are even able to meet the stars of your favorite television shows. Are you planning to head to a comic con soon? Pearson's Renaissance Shoppe has some great costume ideas for cosplayer. Such as our Lord of the Rings Arwen Dress and our Lord of the Rings Aragorn Dark Leather Surcoat. 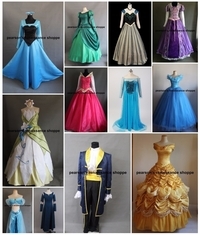 Pearson's has recently expanded our cosplay inventory to include Disney cosplay costumes. Some of our selections include Cinderella, Ariel, Sleeping Beauty, The Beast and Belle, Tiana, Frozen, and more! Here at Pearson's Renaissance Shoppe we even have cosplay costumes for the smallest cosplayer Wizard or Elsa. Are you heading out to a Comic Convention soon? Be sure to check Pearson's Renaissance Shoppe for all your high quality cosplay costumes. Custom sizing and fitting is available to make sure you look your best!